Today, hundreds of teachers went on strike and took to the streets of Manchester to rally against workload, pay, changes to pensions and job cuts amongst other issues. Were you there? Do you agree? Tell us what you think! Do you prefer brilliant badges or beautiful banners? Do you fantasise about trying on a suffragette sash? We’d like to find out what your favourite objects at PHM are. You can tell us at the museum by writing (or drawing!) your answer on one of our chalkboards*, or if you’re not in the area pop it in the comments below. To inspire you our lovely PHM staff will be blogging about their favourite objects over the next few weeks. The top ten objects will feature in a very special ‘People’s Choice’ section on our website, so make sure yours is in there! In general, museums may look at different aspects of the past, but as organisations they are constantly evolving and challenging themselves to think differently about their role in society. Over the course of 2013-2014, with support from Arts Council England, will be undertaking a pioneering new project which will hopefully challenge us to think differently about ourselves, in order to be more relevant in today’s world, resonate with our everyday lives and inspire people to respond. What this means is, we’ll be experimenting with different ways of getting you involved, putting on ground breaking and quirky events, pop-up exhibitions and looking at our collection in a new way. We’ll be finding some hidden gems from our stores and asking you for your stories and experiences and how they relate to your life, both past and present. This is an experiment – we’re not totally sure how the project will play out, which is what makes it so exciting! There’ll be mistakes, there’ll be happy accidents, but we’ll share them with you along the way. We want you to share too! Tell us your ideas, experiences and random musings using the comments below or email Harriet or Catherine. Welcome to the People’s History Museum blog. On this page we will keep you updated with life at PHM; our collections, events, people and random musings! PHM tells the story of ‘ideas worth fighting for’; its collections consist primarily of items from the last 200 years of the organised labour movement in Britain representing the social history of working people. Banners on display at the museum. The museum and archive hold an extensive collection of objects, posters, badges, paintings and some 70,000 photographic images. 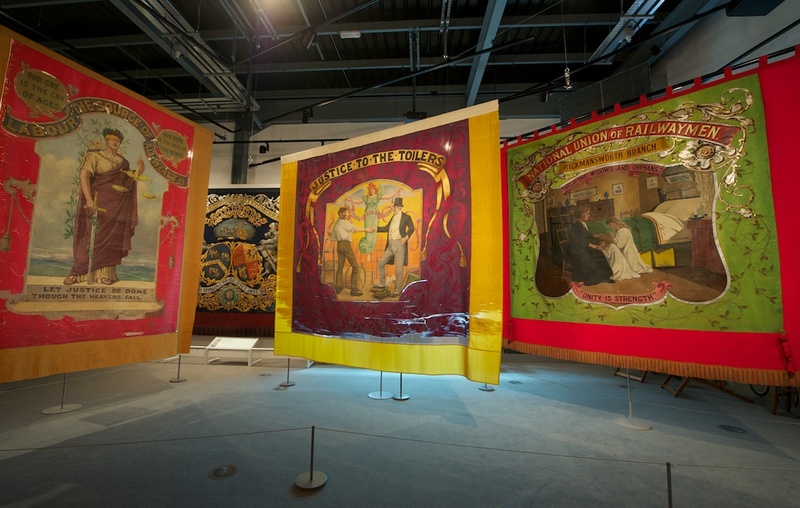 The museum also holds the largest collection of historic trade union and political banners in the world and is the UK’s leading authority on the conservation and study of banners. See here for more info. (http://www.phm.org.uk/our-collection/). 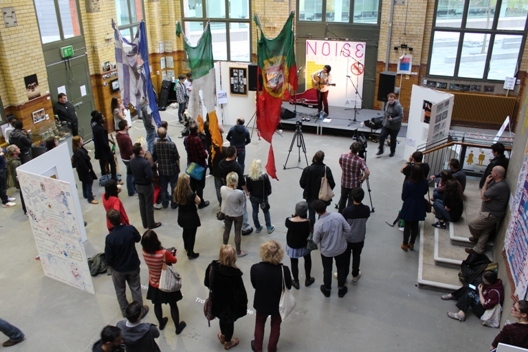 NOISEstock event at the museum. We hold a vast array of exciting events, meetings and learning sessions at the museum every day, so check this blog or our website regularly for updates! To learn more about a few of the interesting projects currently in progress at PHM, check out our other blogs at http://unlockideas.wordpress.com/ and http://wonderwomenmcr.blogspot.co.uk/. We’re really keen to hear your comments and experiences of PHM, from your favourite item to suggestions for more blogs, so please get in touch.